We buy junk cars for cash in Washington, DC! We pay cash for junk cars in Washington, DC and give instant offers up to $10,000! You'll be paid right on the spot by one of our awesome Washington, DC junk car buyers. Washington D.C. is teeming with politicians and other powerful people wheeling and dealing; all of them trying to get ahead by any means necessary. Unfortunately that endless pursuit of power sometimes leads to rampant corruption and generally shady behavior. When you’re trying to sell your junk car, you might also run into a lot of companies and individuals who are looking to take advantage of you. That’s why The Clunker Junker provides some checks and balances on the used and junk car industry! We pay cash for cars in Washington D.C. and do it with integrity. Unlike many of our competitors we don’t try to hide our reputation, instead we wear it like a badge of honor. We’re the best candidate to buy your junk car in DC. We will tow your car away completely free of charge. Our opponents are focused on making the most money for themselves and do not care about what is best for you. One common tactic they will use is called the “bait and switch”. This is where they will give you one price for your car online or on the phone, and then will try and lower it when they arrive to pick the car up. What are you going to do about it? You need the car gone fast, so you end up being forced to take a lower offer for your car. Do not stand for this behavior! Vote for The Clunker Junker because every offer we make is guaranteed never to change at the time of pickup, as long as the vehicle was described accurately. We buy junk cars in Washington DC so we don’t expect them to be perfect and won’t nitpick every little thing wrong with it. How do we plan on fulling our campaign promises, you ask? Easy! We have been buying cars, trucks, vans, SUVs, and more for over 10 years and have created an extremely easy and streamlined process you can use to sell your junk car in Washington DC. There are a lot of wealthy people in DC driving around in brand new Cadillacs, Mercedes-Benz, and BMWs. Unfortunately, not all of us are so fortunate. Are you cruising down U Street in your beat up Ford Focus? (Stop at Ben's Chili Bowl! ), or maybe you're enjoying the scenery on Beach Drive in DC with your sporty Mazda Miata. Whatever you're selling, we'll need to know the exact year, make, and model. We'll also ask about the condition of the vehicle and whether you have the title or not. In most cases our website will create an instant quote for your car. We always try and pay the most money we can based on the information provided, so take a minute to consider our offer. If you choose to accept the offer, we'll kick off our junk car removal process as quickly as possible. Just let us know when and where to meet you. If your address is 1600 Pennsylvania Ave, we may need advance notice. Our Washington DC junk car buyers will arrive in a timely fashion and give the car a quick look over to make sure the condition was described accurately. They will then hand over either cash or check in exchange for your keys, title (if needed), and vehicle. When the car is gone, you'll have time and extra money to check out the amazing exhibits at ARTECHOUSE or the International Spy Museum! It really is that easy to sell your junk car in DC thanks to The Clunker Junker. To start the process, scroll to the top of the page and enter the details about your vehicle. 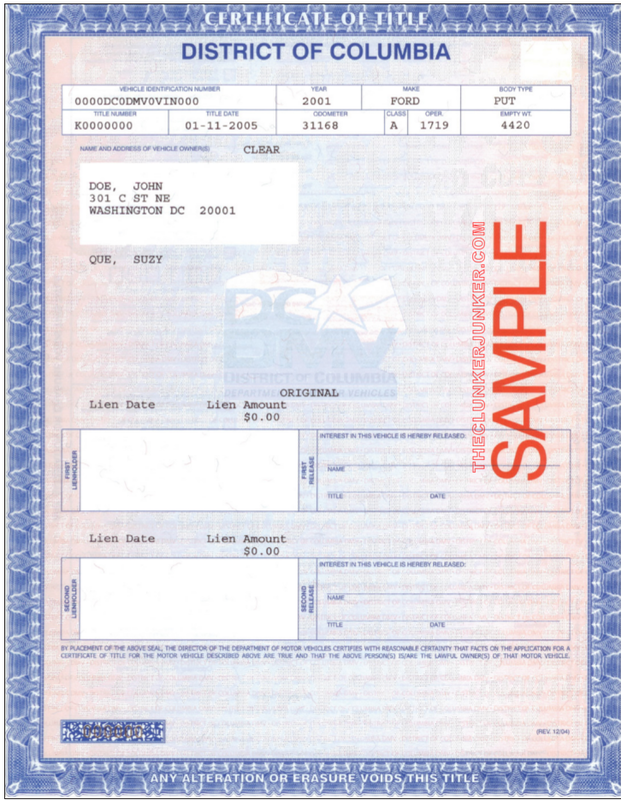 We buy all cars in Washington DC, regardless of age or condition. We buy junk cars in Washington DC of course, but we buy all kinds of cars in varying conditions as well. Just because our name is The Clunker Junker doesn’t mean we aren’t interested in that used car you need to unload quickly because you’re moving away. When you hear someone say "junk car", these are the ones you imagine. The cars are old, do not run, have body damage, or have started rusting away. Usually we can pay anywhere from $50 to $300 for cars like this depending on their age, size, weight, and other factors. Some cars might not have much resale value due to them having really high mileage, mechanical problems, or accident damage. However, they probably have some parts that can be salvaged and resold. Our junk car buyers in Washington DC always make sure to fully and properly dismantle vehicles by properly draining and disposing of hazardous fluids, and recycling the old scrap metal to be reused. Cars that are still usable or desirable. Believe it or not The Clunker Junker buys used cars all the time. In fact, we can usually pay an order of magnitude more money for cars that can be resold on dealer lots or at auctions. This puts us one step ahead of the local DC junk yards who will mostly only crush the car for raw materials. They'll never be able to compete on price for newer and nicer vehicles, in fact we can often beat dealer trade in prices as well! Ready to sell your junk car in DC? Give us a call. When you want to sell your junk car in DC, there is only one name to circle on the ballot: The Clunker Junker. You won’t find a better junk car buyer in the metro DC area who will pay you more cash for cars than The Clunker Junker will. Of course, there is always the added bonus that we will pick up the car free of charge as well. Be careful when getting offers from others, as they sometimes hide their towing charges in the fine print. We do not believe in those kinds of business practices here at The Clunker Junker. Washington DC is full of amazing landmarks like The Washington Monument, Jefferson and Lincoln Memorials, and the amazing National Mall. Rather than let that broken down junk car in your yard become yet another monument in DC, let us take it off your hands. In many cases we’ll be able to pick it up in a few business days or less, and even pick up cars on the same day in some cases. If you’re looking for a cash for cars Washington DC company, you’ve found the best one in the Nation’s Capital. My fellow Americans, help us make your bank account great again by paying you cash for junk cars in DC. Can we buy your car in DC? Yes We Can! 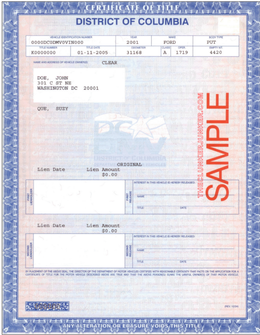 We have put together a simple guide and example for how to sign your District Of Columbia title when you are selling your vehicle. If there are multiple owners listed on the title, they must all sign the title unless the names are separated with "OR". When you're ready to sign your Washington DC title, you'll want to do so on the back. At the top there is a section titled "Title assignment by seller(s)". You should only sign and print here, do not write anything in the first, second, or third re-assignment by dealer sections. 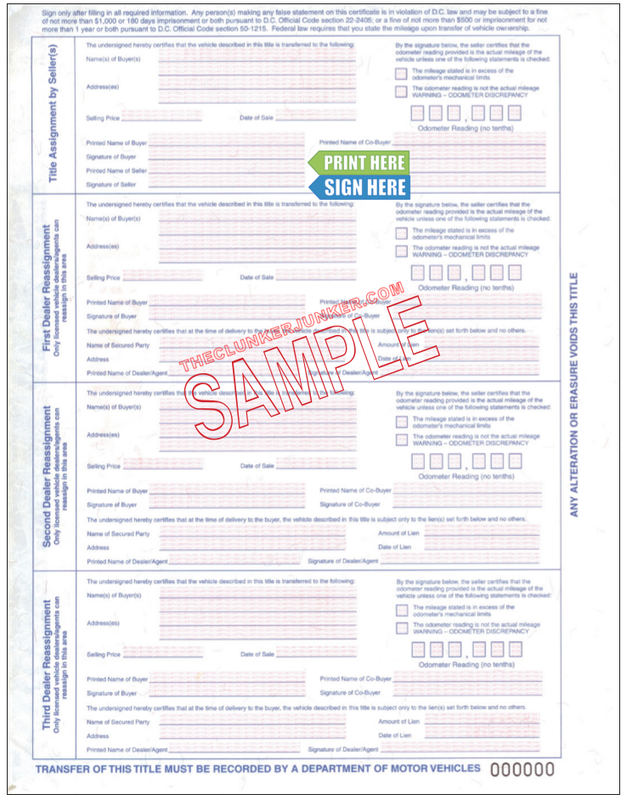 First, print (don't sign) your name on the back of the title where it reads "Printed Name of Seller". Next sign the back of the title where indicated by "Signature of seller" (see image). 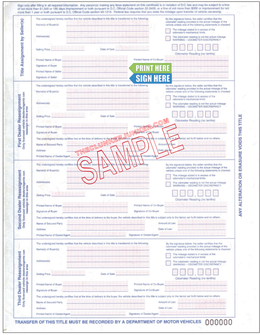 Fill out the District of Columbia Duplicate Title online form. Getting rid of an abandoned vehicle in District Of Columbia can be a difficult process. Unfortunately, you cannot just sell any junk car that ends up on your property if you do not own it. You'll need to follow the District Of Columbia abandoned vehicle removal procedures. We have given a general overview of what that entails below. Unfortunately we cannot usually buy vehicles with no title in Washington, DC. Sorry about this! District Of Columbia has very strict laws around vehicle ownership and we are at the mercy of following those regulations. You would need to obtain a replacemnt or duplicate title from your local DMV (see below). Once you have your title in hand we'll be happy to buy your junk car! The most recent junk car we have made an instant cash offer on near Washington, District Of Columbia was Brendan's 2006 Saab 9-3 Aero in 20007. This 9-3 does not start with approximately 140,000 miles on the odometer and has a clear title, no dents, damage, or rust, and has no flood or fire damage. We offered Brendan $130.00 for their 9-3 with free pickup and tow away! Find out how much cash we'll pay for your vehicle! "I was in a wreck and something is wrong with either the starter or the ground wire. All of the tires are brand new. It's missing the back left pane window. My apartment complex wants it gone by today. I honestly just wanted to sell it for scrap but have no means to get it to a junk yard." "This is my uncles truck. He just passed away and gave it to me, but I don't want it. The rear view mirror is missing the back window has duct tape, but other than that it drives very well." "It is not a running vehicle. It has a soft top which has a zipper that is functional but, needs to sewn. Also, as far as I know the lights bulbs are just blown out. Parts in the vehicle which are missing are the door handle to the Driver's side, the stereo, battery, little trimmings around the stereo, and the speakers. " "The passenger side was struck by two cars. The front door is completely damaged, and the rear passenger side is damaged. The bottom frame was hit from the passenger side which also damaged the driver's side. This also cracked the windshield. " "The gear shifter is actually stuck in reverse as of today. Not sure of the problem, but we were getting ready to junk this vehicle anyways in about two months. So we're looking at options/pricing for junking it now." "The mirror on the passenger side it cracked. I could always get a new one, those are super cheap. There's also a crack on the front bumper cover. The car only has 205k miles. The interior is nice and clean. " Ready to sell your junk car for cash in Washington, DC? The Clunker Junker Washington DC is rated 4.2 out of 5.0 based on 52 reviews across the web.